The World of Peachtree Publishers: Madeline Finn and the Library Dog is a CCBA Winner! Madeline Finn and the Library Dog is a CCBA Winner! We are so excited to share that Madeline Finn and the Library Dog has won the Children’s Choice Book Award in the Kindergarten to Second Grade Book of the Year category! The Children's Choice Book Award is the only national book awards program where the winners are selected by kids. We spoke to debut author-illustrator Lisa Papp about this wonderful honor, so read on for an exclusive interview with her about her book and its impact in the lives of so many children. Congratulations on the Children's Choice Book Award! Did you ever think Madeline Finn and the Library Dog would take off like this? Thank you so much—I haven’t stopped smiling since I heard the news! I didn’t know Madeline Finn would touch so many people. I only knew that I loved creating her character, and the world she and Bonnie share. I didn’t like reading out loud when I was little, and I’ve always loved animals, so Madeline and Bonnie are both very dear to me. They are expressions of things I love and understand. In your opinion, what about Madeline Finn resonates with kid readers? I think it’s the vulnerability. Everyone knows what it’s like to want something, and not be able to get it—no matter how hard you try. There’s an honesty in Madeline Finn’s struggle. And in Bonnie, there’s complete acceptance. When Madeline Finn meets Bonnie, none of her quirks or complications matter. Bonnie loves her just the way she is. I think there’s a great comfort in that. 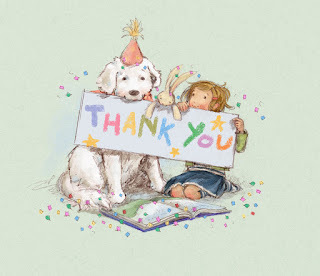 What would Madeline Finn and Bonnie have to say to all the kids who voted for the book? Madeline Finn: Thank you for picking my story! Even though it’s kind of embarrassing when I mess up reading, I found out it’s okay when you have a good friend. I hope your library has a Bonnie too. And a Mrs. Dimple. But if they don’t, I’ll share mine with you. If you want more Madeline Finn in your life (or the lives of the kids around you), check out the Madeline Finn Activity Kit with coloring pages, word searches, and mazes for all Madeline Finn fans! Interested in library dog programs? Whether your local library has one or not, you can find out what it takes to start and maintain a library dog program from R.E.A.D. (Reading Education Assistance Dogs) executive director Kathy Klotz: 5 Steps to Establishing a Successful Library Dog Program.